So you’re headed to your next event or parking spot and your food truck breaks down. What are you going to do now? This article explains what to do to keep your truck, your crew and yourself safe. If your food truck starts sputtering or it is having problems while you’re driving, the first step you need to take is to try to get to the right-hand shoulder of the road as soon as you can, especially if you’re on a highway. If the engine dies on the highway and you can’t get off the road, don’t get out of the truck! Sitting in a dead vehicle while traffic is building up behind can be unsettling, but attempting to cross a freeway on foot is suicide. If your food truck breaks down after dark, put the interior light on so that you’re more visible. If the engine is operable, keep it running so that you don’t run the battery down. Most heavily traveled highways are also heavily patrolled, and a highway patrol officer should be along shortly. Whether you’ve managed to park at the side of the road or you’re stuck in a traffic lane, remember these additional safety precautions. Mark your location. Roll down the window on the driver’s side, hang out a white cloth or piece of paper, and roll the window back up to secure it in place: The cloth or paper alerts drivers that your vehicle is in trouble and that they should proceed around you. Contact someone. If you know that you’re going to need roadside assistance, use your cellphone to call your auto club or the highway patrol: If you have no phone, and you can see an emergency call box only a few feet away, use the call box to call for help, get right back in the vehicle. If there isn’t a call box nearby, you’re probably better off just hanging the white cloth or piece of paper out the window and waiting for the highway patrol. Park safely. To avoid being hit by a passing vehicle, never work on your food truck from the side that’s exposed to traffic. If you can, drive farther off the road to a safe, well-traveled place, and try to reach into the trouble area from the front or the side that’s away from traffic. Use your hazard lights. If it’s daylight, put on your emergency blinkers to alert oncoming traffic to the fact that your vehicle isn’t moving. This is not a good idea at night because motorists coming up behind you may think that your vehicle is still rolling along the highway and run right into the rear end of your food truck. Use reflective markers at night. If it’s nighttime and you’re not stuck in traffic, quickly place warning lights or reflective markers about six feet behind the vehicle to alert traffic, and then get back in the truck. If you get a flat tire, do not attempt to change it unless you can get to the side of the road and the tire is on the side of the vehicle that’s safely away from traffic. Because driving on a flat tire for any longer than it takes to park safely can destroy the tire, you need to replace it close to where it went flat. This is one reason why subscribing to roadside service is a good idea. 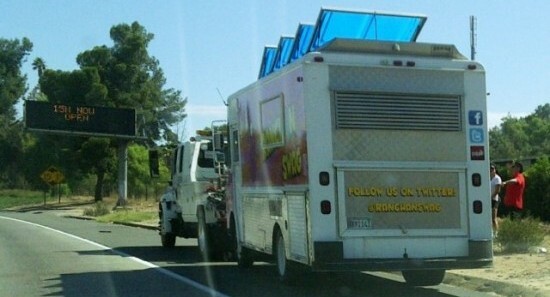 We hope this article helps you in the case if or when your food truck breaks down. It will help you stay safe and make sure you and your staff are able to get back on the road once it’s been repaired.